How to write effective professional resume was the question, I asked myself when I graduated. Do not worry, I have been there where you stand today. If you are reading this article keep reading, because I am here to help you land this perfect dream job. Employers do want applicants who match the exact job criteria according to the resumes submitted by all the applicants for a particular job. Writing effective and professional CV requires time and effort and if you are not in a mood and frustrated by all the rejections you received. Do not panic if you have not received a lot of rejections and not even one phone call for an interview. This only means it is time to change your strategy and approach. I was exactly in the same situation. I applied for 15-20 different jobs per day and I would get one odd call for undisclosed reason. In this article, I will explain the different type of effective skills that are relevant. I will explain how to include the skills on your Resume/CV. This will help you stand out for the job you are applying for and land an interview and do not forget to stop by and say hello, if I was helpful. What is resume skill section? Why is it important and What does it mean? The resume skills section should contain your abilities related to the job you are applying. It is very important to have this resume skills section. In this section you allow yourself re-iterate and extensively expand on the skills you possess and beat the software tracking all the applicants. Resume skill section is often listed as: “Additional Skills “. I want to bring the reality to you and give you the tools and skills to beat the system. If you are applying for significantly large company, it is highly likely that your resume will be crawled by a bot. You can check the company by simply searching for their business name on LinkedIn. You can see the example below. Why am even showing you and telling you these things? It is important to do your research and after that it is all about the right strategy and planning to land an interview. Researching a company will allow you to get right insights, how to approach and construct your resume skill section. The resume skills section can also be listed as: “Professional Experience”. 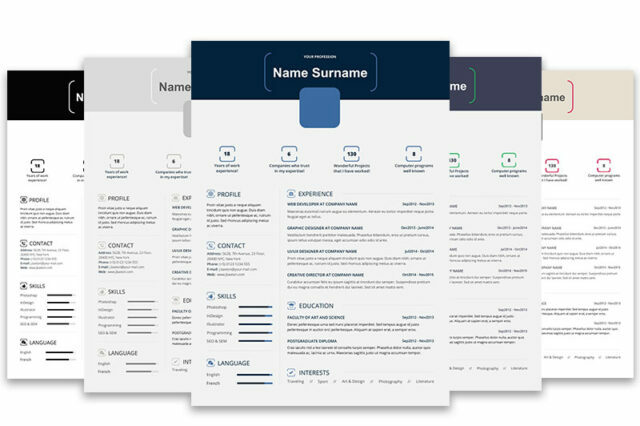 However, if you decide to go for various Resume Templates. Then the resume section can be listed either on the right or left-hand side. It is very important when you list your hard skills to also mention, where exactly you managed to obtain and for how long you applied these skills. If you have studied programming or writing at School or University, do not be afraid to write it down. The soft skills are the interactivity with people. Or the so called: “People Skills”. So do not do the same mistake as me writing only “Good Communication Skills”. This means absolutely nothing to me and to the employers. No surprise, I was not getting any phone calls at all. So for instance, if you write on your resume that you have excellent problem solving skills. It is important to reference your statement, where and for how long you were practicing the problem solving skill. In what company you had to solve problems and what type of problems? I must stress here, it is very important to include bot type of skills on your resume to achieve effective professional resume. Read the job more than once. Once you finish reading it, read it again and ask yourself the question. What the job requires me to do? If there are not sufficient details to draw the picture, you can email or call the company asking for more details. It is not wrong move, if you call the company. You are showing genuine interest and tells the employer you are serious about it. If the job post is raising a lot of questions and doubts, then simply do not waste your time. Some companies are required by law to advertise the job and in reality they already have somebody in mind for the position. However, this is not always the case, some recruiters simply do not know how to list a job or the company itself cannot afford HR professional. I wish, I knew all these insights, when I was applying for jobs. I know it sounds like gamble, but that’s what it is actually. Are The Hard Or The Soft Skills More Important In Your Resume? By now, you must be thinking that hard skills are more important and logically it is correct. However the answer is yes and no. In tough economic growth all the employers are looking to hire people with hard skills obtained already. The reason for this is not that they are not willing to train or invest time. The real reason for this is because of money and time. Each employer is looking for the “right talent” to start immediately with little or no training. Some of the top tech companies like Apple, Facebook, Google etc. These companies prioritize the candidates with hard skills with machine learning capabilities. In fact if you have a lot from those skills, you might not even need a resume. The NAC (The National Association of Colleagues and Employers) has released a survey of approximately 260 organizations that took participation in evaluation of applicant skills they value most. 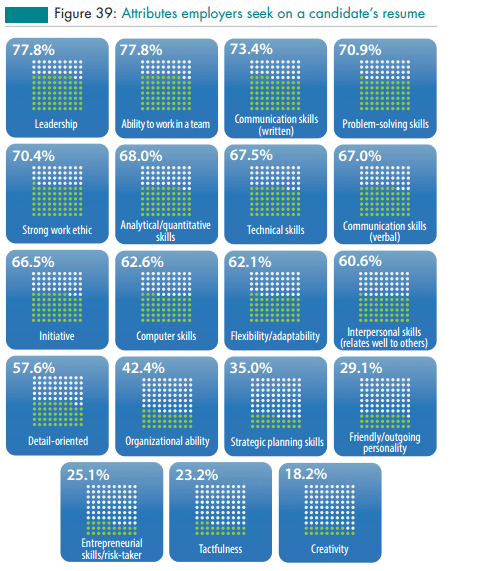 However, looking at the statistics in some particular industries, employers would prefer candidates with “Soft Skills”. If you have noticed, the top 3 skills are “Leadership” with staggering 77.8% then followed close by “Ability to work in a team” 77.8% and 73.4% for you “Communication Skills”. This actually makes absolutely sense. Realistically if you are techy guy, you might be the best in what you do, however if you lack one of these top 3 skills. This means you are not fit to be part of the company. One company requires people who are capable to communicate their ideas across a team of people. If this is your idea, you are expected to take the lead and effectively work within a team. Simply, because when working on larger projects there will be a time scale for the completing the project. I must say through the years of my experience working in various countries and stumbling upon various cultures, it is important to know that companies do not recruit on practical abilities alone. You must fit within their cultural environment and fit in their corporate values. It is good idea to check out these elements, while performing your research. Now it is the time to start narrowing down the findings and effectively list them on your resume and here are very simple steps to bypass the HR Software (Bots). Look at the current trends on the market. Try to look at the job post again and see what is relevant. For example, if you are applying for job on programming. Include only the latest trends within the programming world. Do not include something outdated and irrelevant for the job. This will not make the cut. When you listing your skills in the skills section. Do not write about something irrelevant. Employers are looking for the “Right People”. They want to know if you can do the job and if you are worth the “Call”. 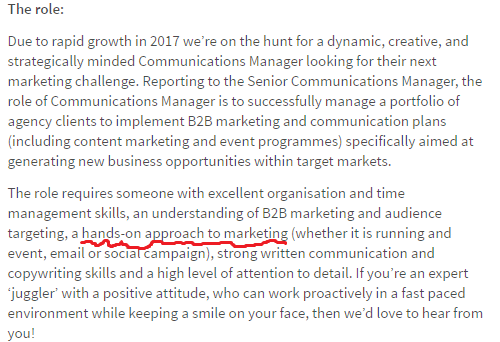 Again write the skills only relevant to the job. If you are applying for a “Project Manager”. You need to list your Leadership, Ability to work in a team, Communication Skills. Also depending on the type of software and technology the company is using to manage the project. Categorize these and Organize them so it make sense. By Using different relevant synonyms and phrases is often helpful. This indicates your awareness and exposure on the industry jargon. You cannot apply for job at Google without knowing the “SEO” term for instance. Usually by using this simple strategy and listing your most valuable skills in your resume. This helps to pass the scanning software. Place your skills naturally and strategically. Your Skills will act as keywords for the software and will help to rank your resume among the other applicants. It is worth to mention, do not spam your resume with these keywords. Also do not play “Smart” by choosing the smallest font, size, colour and pushing everything to the bottom or elsewhere on the page. Trying to make the text invisible for the human eye and trying to trick the software will not help your situation. Please, avoid using cheating techniques. On a resume “Less is more” and it is very important to leave little excitement for the employer. Do not give them all the information. Leave something to talk about once you get the job interview. I would also recommend reviewing all of your social media accounts and try to google yourself and see what results appear on the search engine. It is important to know that some employers would perform these actions. If you have some inappropriate pictures and comments, just change the privacy settings for all of your accounts. Believe me you do not want to work so hard on a resume and let your one of your social media accounts fail you. “Never a tree down in the wintertime. Never make negative decisions in the low time. Never make your most important decisions when you are in your worst moods. Be patient. The storm will pass. The spring will come.” Robert H. Schuller.